It doesn’t matter what the cause of the loss is—fire, water, wind or accident. It also doesn’t matter where the loss occurred—inside, outside or foundation. 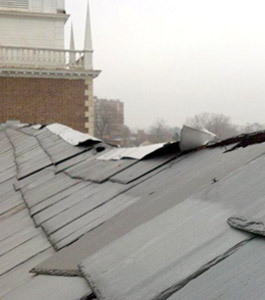 We can repair what has been damaged or replace what was destroyed and deal directly with the insurance company. This will speed up the process and make it a little less stressful. Unfortunately, emergencies usually occur at the most inconvenient time. To make matters worse, most contractors don’t have on-site equipment or materials to deal with emergencies, or the staff to respond. Thanks to Imhoff Company, you don’t have to wait until regular business hours to get a response. We have the staff, equipment, materials and expertise to respond immediately and effectively. We also deal directly with the insurance companies to make sure estimates are seen and evaluated as soon as possible. We’ll work with your insurance company to determine the scope of the project. Then we’ll prepare an estimate that allows us to make repairs with as little out-of=pocket cost to you as possible. Remember, insurance companies don’t specialize in religious buildings and places of worship. We do. Just like every other aspect of repair and restoration, our experience in such a specialized field will save you money.